Main Characters: Tom, Sid, Huck, Aunt Polly, Becky, Mr. & Mrs. Thatcher, Injun Joe, Muff Potter, Joe Harper and Mary. Description of one of the main characters: Becky is a beautiful girl with long blonde hair that hung in braids upto her waist. 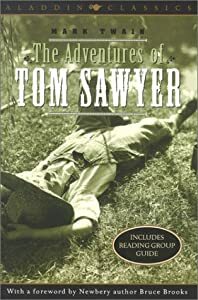 Whom I like and Why: I like Tom Sawyer as he is naughty and helpful to catch the murderers, Injun Joe and his partner. Whom I dislike and Why: I dislike Becky as she is always angry with Tom Sawyer for not being with her and ignoring her. Setting/Theme of the story: Tom Sawyer lived with Aunt Polly and Sid. Tom, Huck and Joe were best friends. They decided to be pirates as they could not steal the Jam. They went to a far away island. But soon they did not like the way they lived. They came back home. Tom and Huck became a witness for a murder done by Injun Joe. The next day Injun Joe blamed Muff Potter for the murder and Muff Potter was put into prison. Tom and Huck liked him as he took them to fishing. They decided to save him. They told the court what they had seen when Injun Joe was present in the court. Before anyone could catch him, Injun Joe escaped and hid himself in a cave. So, the two boys were frightened that Injun Joe would kill them, as they told the court that he was the actual murderer. Finally, the two boys closed the cave and Injun Joe died of suffocation. The boys divided the money stolen by Injun Joe between them with the permission of the court. Tom began to do all naughty things which made Aunt Polly angry, once again. But she was quiet happy as Tom was no more dull. The Part I enjoyed the most: I enjoyed the part when brave Huck saved the widow from Injun Joe. A different ending: Injun Joe was never found. All were in peace. Injun Joe had gone to another country. There were no more thefts, murders etc. The town thanked Tom and Huck and now they were the heroes of the town. Still some envied them. But they were special to every house of the town. Sandhya, This is a great post... thank you for sharing it. Thank you very much. Look forward to interact with you more.